The 1950s and 1960s saw a number of coups in the Arab world. Syria experienced three coups in 1949 (which, OK, isn’t the 1950s, but close enough) and another in 1951, Egypt had a major one in 1952, Syria again in 1954, Iraq overthrew its post-colonial monarchy in 1958, Syria had another major coup in 1961, the Mutawakkilite monarchy was overthrown in Yemen in 1962, Syria (yet again) and Iraq both experienced coups in 1963, Algeria had a military coup in 1965, Syria (Jesus Christ) in 1966, and Libya experienced a coup on September 1, 1969, which is our subject today. There were several causes behind this trend and obviously the mix is a little different for every country in question, but the 1952 Egyptian coup that eventually brought Gamal Abdel Nasser to power was a big trend-setter. Nasserism, a hybrid of socialism, republicanism, anti-imperialism, Arab nationalism, and probably a few other isms, began to look pretty good to Arabs living under weak and/or corrupted regimes that were (except in Yemen’s case) additionally tainted by the fact that they’d been handed power by France and Britain as those two former colonial bigshots were on their way out of the region. Nasser became the model for later movements, and got directly involved in them in a couple of cases (Yemen, for example). But even Nasser wasn’t sui generis, and so what we really need to go back to is the 1948 Arab-Israeli War. The thoroughness of the Israeli victory in that war is what discredited the post-colonial governments in the Arab countries that fought in it, and ultimately left them (except in Jordan) vulnerable to being overthrown. Syria had four coups before 1952, partly motivated by the 1948 war but also, in the 1949 case, backed by the US government in order to grease the wheels for the construction of the Trans-Arabian Pipeline from eastern Saudi Arabia to Lebanon, via Jordan and Syria. Syria underwent so many coups in this period that it even had one against Nasser himself. That 1961 coup pulled Syria out of the short-lived (1958-1961) United Arab Republic, which had joined it with Egypt under Nasser’s rule. Anyway, the point is that this was a pretty messy time in the Arab world. But for most of this time Libya was relatively quiet. King Idris was Libya’s first and only post-colonial king, having united the three regions of Italian Libya (Tripolitania in the northwest, Cyrenaica in the east, and Fezzan in the southwest) under his control. Idris had led resistance to colonial Italian rule in the 1920s, and he later aided the British during World War II. London, in gratitude, backed his bid to become Emir of Cyrenaica in 1949, then to become Emir of Cyrenaica and Tripolitania together, and finally to become king of a united Libya, which was then granted independence by Britain in December 1951. Libya kind of puttered along for most of the 1950s, but then best/worst thing that could happen to an Arab country happened to it: somebody discovered oil there, in 1959. Libya suddenly wasn’t dirt poor, which people liked, but as the 1960s wore on they also noticed that a disproportionate share of all this new oil money seemed to be finding its way to Idris’s wallet, which they didn’t like very much at all. Nasserism still had that new ideology smell, and its socialist aspects really appealed to a population that increasingly felt like it was getting a very short end of a very long stick. People in the three regions didn’t like that Idris had centralized authority in his own person (the better to exploit all that oil money). Plus, Idris’s close relationship with the UK, and then the US, had helped to discredit him among his subjects, particularly when the UK and Nasser’s Egypt nearly went to war with each other during the 1956 Suez Crisis and again when Idris failed to join other Arab nations in the 1967 Six Day War against Israel. Riots became frequent over this period, as Idris’s public support withered away. Enter, starting in 1964, the Free Officers Movement: Libya Branch, not to be confused with the Free Officers Movement: Iraq Branch, which was behind that country’s 1958 coup, or the OG Free Officers Movement, the group behind Nasser’s 1952 coup, or the hilariously named “Free Princes Movement” that tried and failed to overthrow or at least drastically reshape the Saudi monarchy in the early 1960s (with Nasser’s backing). These guys, officers mostly out of the Libyan military signals corps, modeled themselves quite explicitly after Nasser’s movement in Egypt, right down to having a charismatic young officer who dominated what was supposed to be a group of equals. In Libya, that role was played by one Muammar Gaddafi, who had idolized Nasser most of his life (though the admiration was not mutual). Now, it was widely known that Idris’s health was failing, and he’d actually signed abdication papers that were intended to turn the kingdom over to his nephew, Crown Prince Hasan, on September 2, 1969. So on September 1, with Idris in Turkey vacationing/getting medical treatment, the Free Officers swept into the palace in Benghazi as well as key government, media, and military targets all over the country, and took control in a bloodless coup. 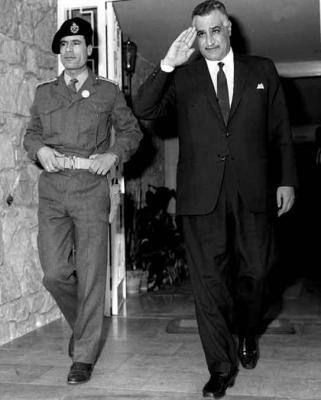 Gaddafi declared the monarchy abolished in favor of the Libyan Arab Republic, and most people were so glad to be rid of Idris that they welcomed the new government with open arms. The Free Officers now became the Revolutionary Command Council and set about running the country, with Gaddafi wisely participating as merely one voice among many and ensuring the country’s transition to true democracy ha ha, are you high? Gaddafi made himself commander in chief of the Libyan military and then systematically rid himself of any competition for absolute authority. He espoused pan-Arabism (then later pan-Africanism, after the rest of the Arab world had basically told him to get bent) and socialism, styled himself as “Leader of the Revolution” without really starting a revolution, sponsored militants and terrorists around the world (including, to be fair, a couple whose aims were Actually Good, like the African National Congress in South Africa), and governed as a brutal despot most of the time. Meanwhile, for a guy who was in such poor health that he agreed to abdicate before the coup that forced him from power, Idris lived a good, long time; he died in 1983, at the age of 94, in Cairo. Libya is, of course, still trying to get a grip on itself after 40+ years of Gaddafi and several more years of absolute anarchy. Who knows what that country would look like today if the 1969 coup hadn’t happened, but it’s hard to argue that it would look any worse than it does now.